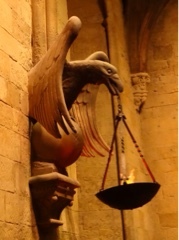 On the walls were gigantic flame-filled torch holders carved to represent the house animals. 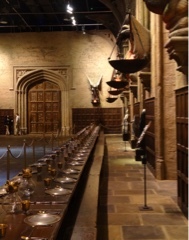 All along the sides of the Great Hall were figures from the films dressed in their original costumes. The intricate work in each one of them must have taken weeks to make - especially for the main child characters as the series progressed when they grew larger. 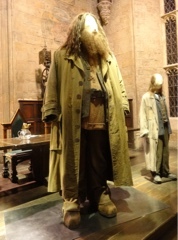 This one is Hagrid's outfit. 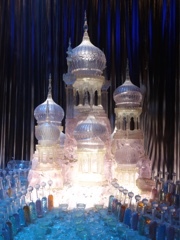 Wandering into another set I was enthralled by this glass model of the castle surrounded by hundreds of glasses of all shapes and colours. Everywhere we went the size of everything we saw was so impressive. 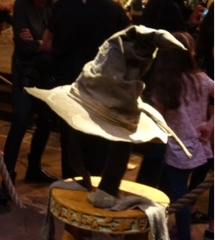 And the attention to authentic detail amazing. Here are just a few of the sights. 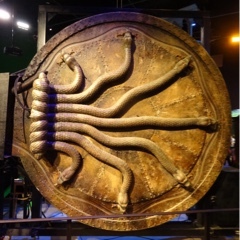 And the door to the Chamber of Secrets. 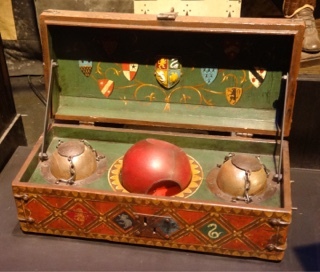 Although we didn't see the Golden Snitch (actually gold-plated) this is a box containing Quidditch equipment. So much to look at. 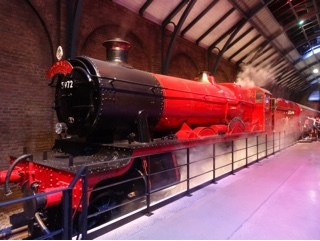 Suddenley, turning a corner we came across a full-size railway station and on platform nine and three quarters there was the Hogwarts Express. 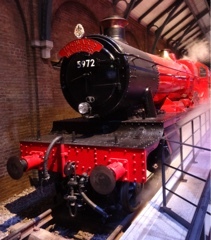 The smell,of the steam coming from the funnels took me right back to my childhood. And we were able to walk inside the carriages. The actual train served as a working passenger locomotive from April 1937 until it's retirement in December of 1963. 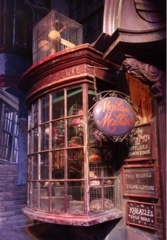 We'd spent about two hours touring the many sets by this time so it was nice to have a seat in the backlot restaurant for a drink and snack. 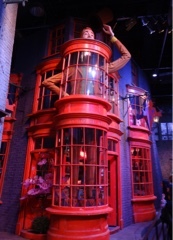 Between the major stages was Privet Drive. 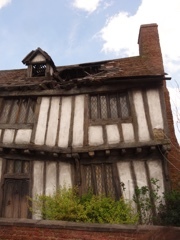 (In the original film, Harry Potter and the Philosophers Stone, the exterior of the house was filmed in Bracknell). 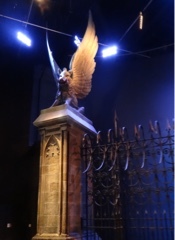 All the other films made use of this recreation. Here's one of the houses at the end of the street, and then part of Hogwarts Bridge, created for Harry Potter and the Prisoner of Azkaban. 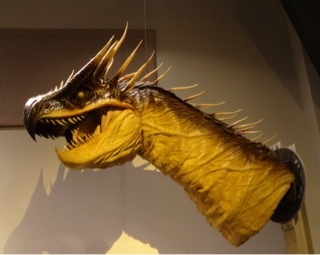 The next stage was one of my favourites as it showed hundreds of creatures and intricate prosthetics - from the Basilik and Buckbeak to Lord Voldemort's snake-like face. 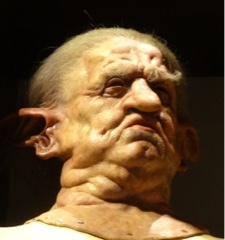 Many of the figures and faces were worked by animatronics and were made of steel and foam. I've shown just a tiny amount of the hundreds of thousands of exhibits. 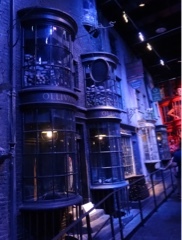 But now, towards the end of our tour, we strolled down Diagon Alley. 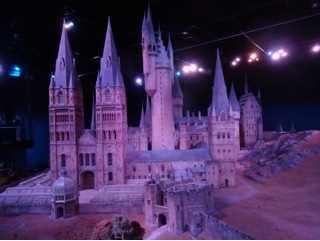 And finally to a vast room housing an immense model of Hogwarts Castle. 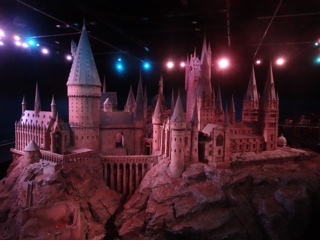 Everything in this castle is perfectly hand-sculpted to scale. Artists used real gravel for rock work and boulders, and real plants for landscaping and trees. As we walked around the model castle the lights within the castle changed to simulate daylight and nighttime. What a great afternoon. I'd recommend going on this amazing tour to everyone - no matter what age you are. And thank you MYF for a really exciting time. Now back to reality. On Saturday we had our first trip on the river. 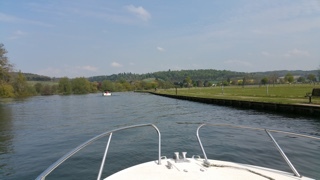 Marsh Mundy is fully functional again so we tootled off down to Hambleden and back. A little family of Canada geese that have made their home next to my mooring led us out of the millpool. 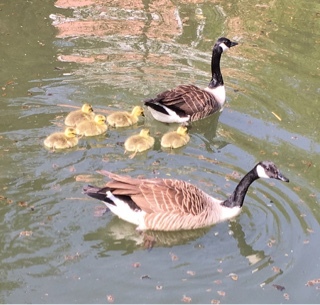 The six newly hatched goslings had their first trip out to the big river. My young friend gave the hull a bit of a clean before we set out. Apart from a number of rowers the river was surprisingly quiet. This was the view as we left Temple Island. And I'm enjoying the sunshine. 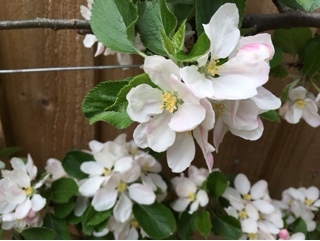 The apple blossom is out so we hope there's no more frost as it only produced three apples last year. On Thursday the banana plant was relieved of its winter coat. Not only has it survived but three new little banana plants are shooting up around the main stalk, and the first leaf has shown itself. Yesterday some of the hostas were divided, the patio rail has been given a few new coats of paint, and MYF has spent hours mowing the lawn, replanting hostas, potting on, and all the other things that need to be done at this time of the year. 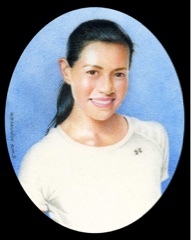 On the work front I've finished a miniature of my friend, Fon, who lives in Bangkok - not a commission - but because I wanted to. However for most of my eight and nine hour days over the past fortnight I've been painting a full size oil portrait. It's going well and I'm half way through it. The canvas I'm working on is a bit strange as the primer creates a very dry and matt surface. No doubt all will be well when it's finished and I give it a coat of varnish. 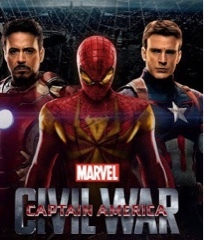 We went to the Regal last Tuesday to see Captain America - Civil War. 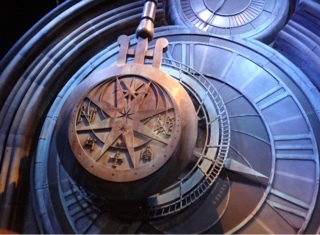 Really exciting and incredible effects and costumes. I must admit though that I couldn't figure out who was fighting who, and whether the main characters were goodies or baddies. 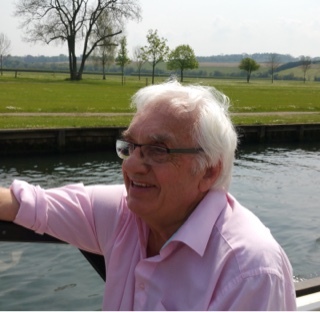 So while we were having dinner at the Catherine Wheel afterwards, my young friend (who knows almost everything) filled me in on the story!